China’s Recent Trade Deficit: Is What You Yuan What You’re Gonna Get? China ran its first monthly trade deficit in six years in March, a development which encouraged the country’s Commerce Ministry to up the volume a bit on the argument that the need to revalue China’s currency was being greatly exaggerated. The debate surrounding renminbi revaluation has also given us one more reason – beyond the recent accusations of the US SEC – to cast a watchful eye over how things are done at Goldman Sachs: the outrageous suggestion from their Chief Economist Jim Oâ€™Neill (in this Financial Times article) that if things carry on as they are, China will soon overtake France as the principal destination for German exports (see in depth analysis below). Looking through the data, it would appear that while China’s March performance was undoubtedly a one-off, import growth has been outpacing export growth for some months now. 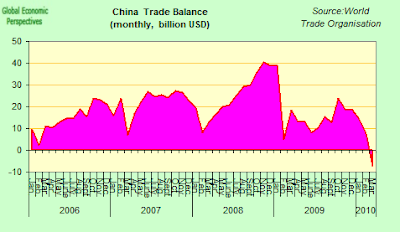 And with imports of commodities surging, and with them commodity prices, it was not really that surprising to find that China swung into a trade deficit of $7.24 billion in March, from a surplus of $7.61 billion in February, according to figures issued by China’s Customs agency. Overall imports were up 66% from a year earlier in the moth, with purchases of crude oil and copper at near-record levels in volume terms. In fact Chinese officials had been signalling for some weeks that March could produce a rather exceptional trade deficit, a development they highlighted to show how China’s strong growth has been boosting its purchases from other countries. 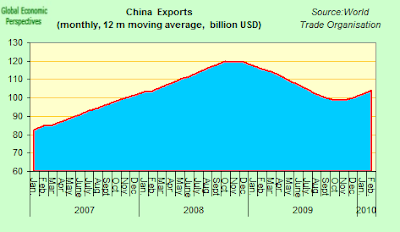 But beyond the March reading, China’s trade surpluses have been shrinking as the government stimulus plan, and extensive bank lending, have boosted domestic demand, and indeed the cumulative trade surplus for the first quarter of 2010 fell 77% from a year earlier to hit $14.49 billion. Evidently one month’s data is unlikely to convince anybody, and especially when there is so much doubt surrounding the sustainability of China’s domestic consumption growth, so the March data is surely unlikely to silence the deafening roar of international criticism of China’s trade policies, and indeed European voices are now increasingly being added to US ones. Evidently March’s exports may well have lower than normal as factories took their time reopening after the February Lunar New Year holiday. Exports were up in March, but the rate of increase fell to 24.3% from a year earlier, as compared to the 31.4% annual growth registered in the first two months of the year, although it is hard to tell how much of this weakening was a Lunar New Year effect, and how much the development reflected domestic demand weaknesses among China’s main customers. “As far as Chinaâ€™s involvement with the rest of the world goes, the real story since the worst of the crisis is not Chinaâ€™s recovering exports but Chinaâ€™s strong imports. The forthcoming trade release â€“ interestingly due a few days before the Treasury report â€“ is likely to demonstrate enormous import growth again, absolutely and relative to exports. 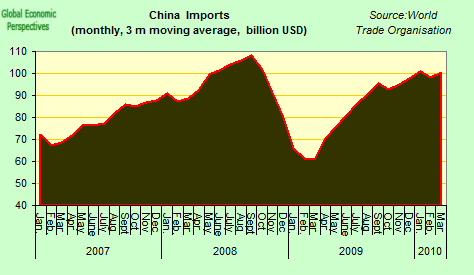 This is seen not just in Chinese data, but in those from many other important trading nations. Indeed, quite remarkably, Germanyâ€™s trade with China is showing such strong growth that by spring next year, on current trends, it might exceed that with France”. This is quote a claim, and evidently impressed both Tyler Cowan at Marginal Revolution, and the Economist Free Exchange Blog, since they quote precisely this extract in support of their argument that the threat to global economic stability represented by China’s trade surplus is being rather overdone (which may or may not be the case), and they obviously take his China overtaking France claim as good. As a student of German export performance, I however did not. The most important point to bear in mind is that Germany basically missed out on the first wave of China import growth (with the market being largely dominated by Japan). To give an indication, in 2008 German exports to the Czech Republic and to China were of about the same order of magnitude, a data point which is reasonably suggestive of the extent to which German export growth 2005 – 2008 was dependent on growth in Central and Eastern Europe (both inside and outside the EU). Growth in this market has, of course, now come screeching to a halt, hence the renewed German interest in China, and in general terms, non-European export destinations – which is one reason why, at the end of the day, the sharp drop in the value of the Euro has been as much to Germany’s advantage as it has to that of any other Eurogroup country. So just what are the facts? Well, according to the most recent release from the German Federal Statistical Office, German exports to China were worth 36.5 billion euros in 2009. Which means that, compared to 2008, exports to China were up around 7%, while total German exports declined 18.4% during the same period. 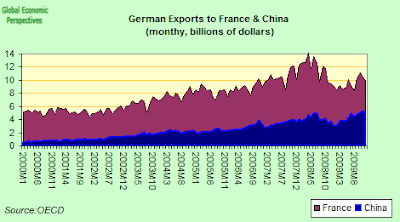 So evidently the importance of German exports to China has been growing, but nothing like as much as O’Neil claims. Really! The second chart puts things in a longer term perspective, and what stands out is the fact that while German exports to China have followed a steady path, while those to France slumped significantly in 2008 as a result of the global economic crisis. So what this means is that exports to France are unusually low (and thus it is impossible to talk of trend), while those to China are unusually (and possibly unsustainably) high, given the impact of the stimulus programme. So to extract his “trend” (which is in no case valid) Goldman Sachs’ Chief Economist seems to be assuming a worst case scenario for France and a best case one for China: hardly a balanced methodology. Or does Jim O’Neil really want to tell us he is discounting the possibility of a sustained recovery in demand in the OECD economies? Even without the benefits of our own “proprietary indicators”, simple testimony of the naked eye should tell us he is wrong here. Where we go from here on the China trade front is now very hard to tell. Evidently, on the one hand, evidence continues to mount that more flexibility in yuan parities in in the pipeline. But will the much sought after revaluation really do all that heavy lifting that is being expected of it? After all, Germany’s currency was effectively revalued upwards on joining the Euro, and the country then spent several years putting downward pressure on cost elements, with the result that the German trade surplus was even larger (as a % of GDP) in 2008 than it was in 1998. And China’s almost unique demographic trajectory also suggests that promoting internal consumption as a growth driver may be up against significant constraints. Life Cycle Theory Nobel Franco Modigliani, in what was his final published paper (2005) – The Chinese Saving Puzzle and the Life-Cycle Hypothesis – drew attention to this oft neglected dimension which evidently forms part of the problem. At the very least, some simple economic theory suggests that all may not be as simple here as it seems at first sight. On the other hand Chinese officials, far from showing signs of alarm at March’s deficit, generally seem to have welcomed the development. According to Zheng Yuesheng, director of Statistics at China’s customs office, “This kind of deficit is healthy as it happened while both imports and exports experienced rapid growth,” and in any event, as he also points out, China will undoubtedly continue to run (smaller) trade surpluses over the long term. This, at least, has the benefit of being a realistic, and pragmatic assessment of the situation. All we need now is for a bit of this realism and pragmatism to work its way steadily westwards. I think the point is Jim O’Neil is talking about trade, not exports, so need to include imports. 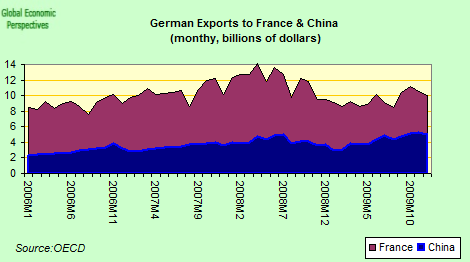 For Germany these were equal from China (8.2%) and France (8.2%) in 2009, so add in imports (4.5%) and (10.2%). Now Germany’s imports are smaller than exports but this must make the difference something like that 6% to 9%, so a nearer gap? I marvel at the idea of China becoming an import powerhouse. While this idea might be directed at consumers on the coastal cities, it’s not likely to catch on in Interior China. Furthermore, there is very little internal consumption in central and west china. And so long as Beijing continues to ignore these regions, this ever-widening regional disparity will only hinder overall long-term growth. How does it work that when the yuan appreciates that dollar price commodities would become more expensive for chinese producers. Right now we “underpay” for their products and conversely they “overpay” for dollar priced goods. Paying extra for dollar priced goods is part of the cost of a dollar peg, along with having to borrow in expensively while lending out cheap. It’s the dollar price of commodities that will rise, not the yuan price (which is likely to fall). Think of a yuan appreciation as a dollar depreciation, and dollar depreciation = higher price for goods priced in dollars, ie highier commodity prices in dollars.